When it comes to United States visas, there are dozens of different visas that you can apply for depending on your country of origin, the reason for your visit to the United States, and how long you intend to stay. You can learn more about the visas available to you on our website. The most important thing to do before you apply for your visa is to know what type of visa you actually need. It’s not always as straightforward as you might think; there are at least three different student visas to choose from, and things become even more complicated if you are coming here for work. To make it even more confusing, there are some countries that participate in the Visa Waiver Program (VWP) with the United States, which means under certain circumstances you do not need to apply for any type of visa before your visit. If you are planning on coming to the United States, it’s a good idea to talk to an experienced immigration lawyer who can answer your questions and ensure you are getting the correct visas before your trip. Doing so can not only save you considerable hassle at Border Control, but it can also help ensure you can return to the United States for subsequent visits or even to immigrate there permanently. It is best to consult the U.S. Customs and Border Protection website to ensure your country is still eligible for the VWP before booking your travel. If you do not qualify for the Visa Waiver Program as listed above, then you’ll need to apply for a visa before coming to the United States. This includes those who are visiting the United States and coming from countries not listed above, students, cultural exchange programs, fiancees, intracompany transfers, those moving for employment, and many others. It also includes those seeking to reside permanently in the United States, who will need to apply for an immigration visa. Failing to apply for the correct visa can have massive repercussions on your future. This can include being denied reentry to the United States at a future date (a ban that can last for years) as well as causing you to be ineligible for a green card, or permanent residency status, in the future. You should not enter the United States as a visitor or tourist and assume it will be okay to overstay the 90-day limit; this can cause serious issues with any application you submit to U.S. Customs and Immigration Services in the future. Whether you are coming to the United States or are already here, it’s vital that you follow the correct process for getting your visa in order to avoid additional expenses and delays. Working with an immigration lawyer can help, even if you aren’t yet seeking to immigrate but want to come to the United States under a different type of visa. An immigration lawyer will understand the application process thoroughly and be able to assist you in navigating the tricky legal waters of immigration law. Having trusted counsel on your side not only improves your chances of a positive outcome, but gives you someone who will put your best interests at the forefront of the process. 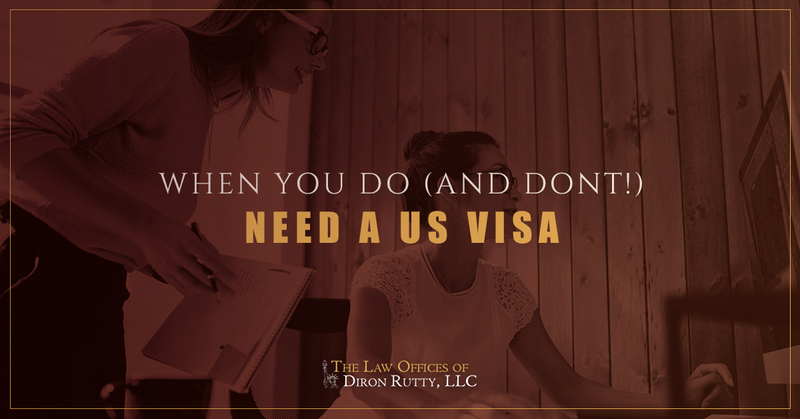 If you are going to be applying for a visa to come to the United States, the Law Offices of Diron Rutty, LLC may be able to help you with the process. Contact our office today for a free, confidential consultation with an immigration lawyer in The Bronx who can answer your questions and help you determine the best path towards getting the visa that you need. Call or fill out the form on our website now.